Lava from Hawaii's Kilauea Volcano has creeped onto the property of one of the Big Island's geothermal power plants, civil defense officials said. In an update issued late Monday, the Hawaii County Civil Defense said lava from Fissure 22 crossed onto the property of the Puna Geotherma Venture. In response, the company quenched 10 of its 10 wells. County, state, and federal partners have been collaborating closely to monitor the situation and work with PGV to ensure the safety of the surrounding communities," civil defense said. "Efforts are ongoing to make sure the site is secure and the community is kept safe." The volcano in the southeastern region of Hawai'i Island began erupting nearly three weeks ago, first with plumes of pink smoke and lava vents. 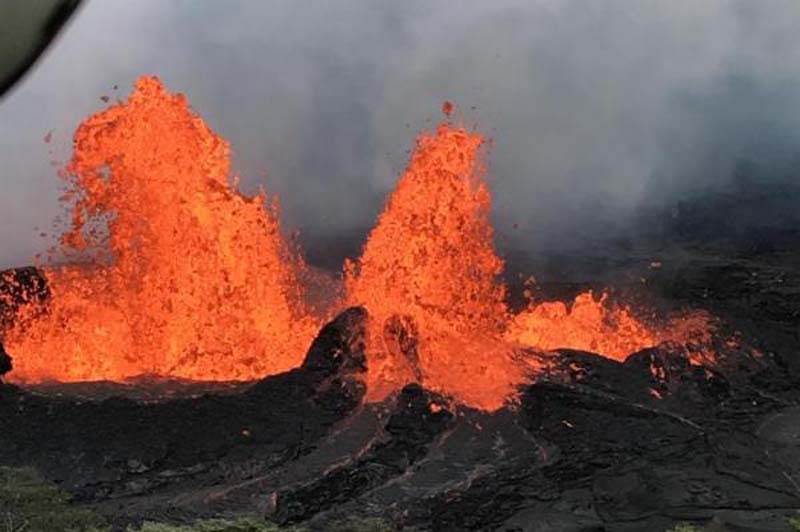 More fissures opened in the ensuing days and lava flows in residential areas damaged or destroyed at least 40 structures, more than 20 of which are residences. Over the weekend, a man sustained the first injury related to the volcano after a "lava bomb" struck his leg as he stood on the porch of a home near a fissure. Over the past several days, lava has erupted up to 300 feet in the air in some areas, while lava flows reached the ocean over the weekend. The National Weather Service and U.S. Geological Survey's Hawaii Volcano Observatory have issued warnings about dangerous ashfall and toxic gasses emitted from vents throughout the area. The University of Hawai'i at Manoa predicted hazardous levels of volcanic smog, or "vog," downwind of Kilauea, along the southern coast and toward the west.